How much do you know about our Larned Chamber Bucks program? Take a moment to learn about our Chamber Bucks program through the question and answer format, and you just might learn the answers to the questions you’ve been asked, or are asking yourself! 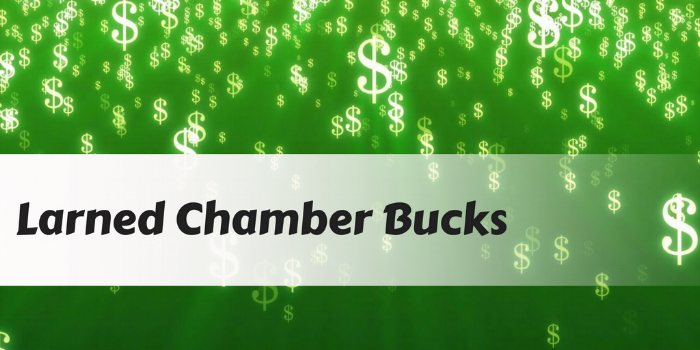 Q: What are Chamber Bucks good for and how do I spend them? A: What better way to shop and support our local businesses and economy than Larned Chamber Bucks!? Larned Chamber Bucks can be spent just like cash at any of your favorite Larned Chamber Member Business. Q: Where can I spend my Chamber Bucks? A: Larned Chamber Bucks are redeemable at over 100 Larned Area Chamber Member Businesses. Any of our current members of the Larned Area Chamber can accept Chamber Bucks and deposit them just like you would with a check. To make things easy for you, we’ve attached a listing of our current Chamber Member Businesses through the button below. Remember, only Chamber Member Businesses are allowed to accept Chamber Bucks! Q: Where can I get Chamber Bucks? A: Chamber Bucks may be purchased from the Larned Area Chamber office in $10’s. Several businesses and individuals have also purchased Chamber Bucks as gifts – have you been a lucky recipient?! Do you have additional questions about the Larned Chamber Bucks program? If so, or if you would like to purchase Chamber Bucks, please contact the Chamber Office at 620-285-6916 or larnedcofc@gbta.net.